I am so pleased that Tiger was born at home and that everything went the way I wanted it to. Cherry’s birth wasn’t the experience I was hoping for. I met my little girl at the end of it and for that I am so grateful but when I found out I was pregnant this time I wanted to try and do everything I could to have a more natural labour. Tiger was born, in my bedroom around midday on the 5th of April. 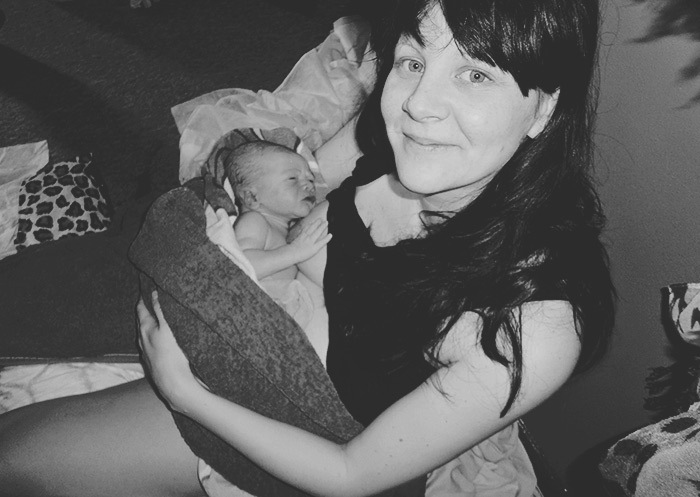 I decided to have a home birth when I was about 30 weeks pregnant as I was starting to feel really anxious about the thought of going to hospital, and especially of having to potentially be away from Cherry for one night or more. To start with Mr C was a bit worried but by the end he was 100% supportive of the plan which helped me to feel more confident. I bought the Maggie Howell Natal Hypnotherapy book and CD and listened to it regularly up until the birth, I even had it on in early labour and I would recommend it to anyone as I know it helped me so much. So I went to my 41 week midwife appointment and she gave me a sweep, she also told me to go by my own dates which only made me 2 days overdue (Cherry and Tiger were both born 4 days over their due dates in the end!) and said she was fairly confident things would happen within a couple of days. The next day at 2pm I started getting early labour contractions, they were really mild but I got excited and was sure he would be born that night. They continued to get stronger all evening and by 10pm I phoned the hospital just to let them know that I was having contractions and to check there was a midwife available for home births in my area. I put my tens machine on and made sure I was eating and drinking regularly. By 2am they were getting really strong, I was having to breathe all the way through and couldn’t talk through them so phoned the hospital and said I thought I needed a midwife to come out. I was sure that second time round I would know when I was in active labour but I didn’t! The midwife turned up and I think knowing she was on her way freaked me out because my contractions had stopped altogether by the time she’d arrived and she went home again after an hour because things hadn’t picked up. She examined me and said I was 3cm which meant that I was coping a lot better than last time when I had already lost control and gone into hospital. We went to bed and I actually managed to sleep for a few hours, I had a hot water bottle on my bump which helped a lot as well as the tens machine which I found amazing. The next morning I ate some breakfast and ended up calling out the midwife again at around 9.30am but the same thing happened and after making me walk up and down the stairs five hundred times she decided to go home. I am actually really glad that both of these midwives didn’t stay as I didn’t get a very positive vibe from them. In fact the second one was so negative she actually made me doubt my ability to even be able to stay at home, I started crying when she left as I didn’t think I would be able to do it. I had a bath and went back to bed at about 11am and within an hour I was leaning over my bed screaming into a pillow each time I had a contraction. Now I know what they mean by strong contractions, they made my earlier ones seem like nothing but last time I’d had drugs followed by an epi-dural so I had no idea how strong they got! Mr C was still downstairs with Cherry at this point, filling up the birthing pool (which I never actually ended up going in!). We hadn’t really decided what was going to happen with Cherry as we knew it would depend on how I was coping with everything and what time of day it was, I think kids being around for births is a lovely idea but it didn’t feel right for me when it came to it as I was worried that my screaming would scare her so luckily Mr C’s mum was free and came to take her out for lunch within ten minutes of being phoned. The third midwife turned up just as they were leaving and she was lovely, from the moment she walked into my bedroom I felt like she was the right person to deliver my baby. She helped me walk to the toilet and she examined me and told me that I was 8cms and nearly ready to start pushing! She called for a second midwife and was so reassuring. The hypnobirthing CD helped me so much in feeling confident and trusting my body but I was still unable to relax through contractions, with every one she reminded me to breathe and not to be scared – something which is just so hard when you are in that much pain! As my waters still hadn’t gone she mentioned that there was a chance the baby would be born in his waters, I was in another world by this point but Mr C (who is incredibly squeamish) said it made him freak out a bit! They did break a few minutes later and then it took 41 minutes for him to be born. I did lose it a bit at that point, I was kneeling over the bed and can remember crying and saying I couldn’t do it and that he was stuck and never going to come out. The 1st midwife was great though and really made me feel like I was doing a good job. I kept getting cramp in my leg so the second midwife was massaging it the whole time! Mr C was on the other end of the bed and had the job of passing me water and sweets, he’s terrible with anything medical so I was more than happy for him to hang back and watch from a distance. I can remember her keep telling me about the head coming round the corner, it felt like it was taking forever but then I started to feel the stretch and THE BURN of his head coming out, the worst bit was waiting for the next contraction to push it out completely and I pretty much shouted out every expletive under the sun while that happened but once that was out I only had to wait a couple of minutes for the next contraction then he was out and the relief was like nothing I have ever experienced before! I sat back and the midwife passed him up between my legs and it was just the best feeling. He didn’t cry but there wasn’t that scary moment of wondering whether he was okay, he was just chilled and relaxed with his little eyes open. This was taken about one minute after his birth. It’s not the most flattering of photos but I’m pleased I have it as it captured such a special moment. We moved up onto the bed for skin to skin and he fed while we waited for the umbilical cord to stop pulsating. I had planned not to have the injection to speed up the delivery of the placenta but after about 40 minutes it still hadn’t come out and I started to get really bad contractions again, they actually made me cry so I agreed to have it and within two minutes it had come out and the pain stopped. Then we just got to enjoy cuddles while the midwives filled out my paperwork. It honestly couldn’t have gone any better, there were no scary moments, no mention of hospital and being able to sit in your own bed and have a cup of tea after giving birth is just amazing. The midwife checked me before she left and luckily I only had a graze and didn’t need any stitches which was a BIG RELIEF after last time! My actual labour was only 2 hours 51 minutes and I did it with no pain relief, other than the tens machine which I found helped me so much. It was never my plan to do it without any gas and air but by the time it was offered I was already pushing and it seemed pointless then as I didn’t want to spin out and feel sick. Then when it had all calmed down Cherry got to come up and meet her brother (post coming up on that!). Initially I wanted him to be born at night as I thought she would sleep through it but now I am so pleased it was daytime as I was so noisy and there is no way she would have slept through it. We all chilled out in bed for the rest of the day then ordered an Indian takeaway which was quite possible the best meal I have ever eaten. Not only was I ravenous but I no longer had a baby to squash my tummy and give me heartburn so I demolished a ridiculous amount of food. Then I had a nice hot bath, Cherry went to bed normally and we sat downstairs watching telly like any other Friday night, only with our newest family member for company. My home birth was more amazing than I ever could have imagined and if I ever have any more children it will be my first choice.